Background: The aim of this study was to evaluate the correlation between the level of kyphotic deformity of spinal column among osteoporotic patients during balloon Kyphoplasty with T-score and Z-score and the effect of osteoporosis on the results of kyphoplasty surgery. Methods: After operation conducted patients suffering from osteoporotic fractures resorting for kyphoplasty from 2015 to 2016. Based upon inclusion criteria, the patients underwent kyphoplasty. Kyphotic angle, Cobb angle, the height of the fractured vertebrae in the anterior, the middle and posterior parts of the body in each patient were measured and assessed before and after operation. Results: A significant reduction was observed in post-operation VAS compared to what was observed prior to operation. The post-operation average pain had also decreased in various times (immediately after operation, 2 weeks later, 6 months later) (P=0.0001). The kyphotic angle and post-kyphoplastic Cobb angles had reduced and the height of the vertebrae in the anterior and middle part of the vertebrae had increased. As the level of osteoporosis increased, the sagittal correction was balanced and the height of vertebrae increased. There was no statistically significant correlation between VAS and the level of osteoporosis (P=0.909). The unilateral and bilateral injection of cement caused no significant difference in the results of operation and VAS (P>0.05). There was no significant correlation between the amount of injected cement and correction level of kyphotic and Cobb angles and rise of vertebrae’s height. Conclusions: Kyphoplasty helps improve kyphosis angle and Cobb and increases the height of vertebraes and reduces pain. As the level of osteoporosis increased, the level of sagittal balance correction and height of vertebrae also increased, but no significant correlation was observed between it and average pain reduction. Kyphotic deformity, Osteoporosis, Balloon surgery. Kyphosis and curvature of spinal column caused by fraction of vertebrae particularly in the anterior area . Spinal column has three natural curvatures. One of them is in the neck area which is a forward curve with backward concavity called lordosis. These angles are naturally -20 to -40 degrees. In the dorsal area, there is a backward curvature with backward convexity called kyphosis with a natural angle of +20 to +40. In the lumbar area, there is a forward curvature with backward convexity called lordosis with a natural angle of -30 to -50 degrees. The unusual rise caused in the dorsal area is called hyper-kyphosis . Kyphosis is caused by various factors including old age, muscle weakness in the upper dorsal area, Shamrn disease, arthritis or other bone degeneration diseases, osteoporosis (loss of bone power due to the old age), damages caused to the spinal column, weakened disk, Scoliosis (spinal column curvature), infections in spinal column, birth defects such as spina bifida (bone splitting), tumors, endocrine system diseases, connective tissue diseases, polio, Paget's disease and muscular dystrophy . Following an osteoporotic fracture and reduction of vertebrael height in anterior and middle parts in the elderly, patients would experience thoracic kyphosis which may be painful or painless. Various methods have been proposed to diagnose kyphosis including clinical examination such as neurological examination to study reflexes and muscular power, studying how patient walks, X-ray to determine curvature angle and diagnose vertebrae transformation and assess sagittal balance, computational tomography, CT scan for images with greater details, and magnetic resonance imaging (MRI) to study the tumor or vertebrael infection. If the curvature affects patient’s breathing ability, pulmonary performance tests and cardiovascular assessments will be conducted [4,5]. Standing face radiography is used to study scoliosis while standing sideview radiography is required to study kyphosis angle. If the radius of kyphosis is open in standing sideview radiography, this type of kyphosis will be considered soft and flexible, but the kyphosis will be harder if its radius is tight [6,7]. Surgeries usually seek to reduce pain and improve the life quality of patients suffering from osteoporotic fractures. One of the modern methods of treating kyphosis surgery is a method known as kyphoplasty. A small balloon is used in this method to restore the vertebrae to its original height. Then, a cementlike substance is injected to reconstruct the height of vertebrae. This method is usually used for cases of kyphosis caused by compressive fractures among people suffering from osteoporosis [8,9]. The present research seeks to study the clinical results of balloon Kyphoplasty and the correlation between the kyphotic correction of spinal column deformity among Osteoporotic patients during balloon Kyphoplasty using T-score and Zscore. This is a case series, quasi-empirical, clinical trial research prior to and after operation conducted on patients suffering from osteoporotic fractures resorting to Vali Asr Hospital of Arak for kyphoplasty in 2015 based upon T-score and Z-score level. The following inclusion criteria were defined: pain caused by osteoporotic fracture, a distance of 4 to 6 weeks between the occurrence of fracture and no response from pain to medical treatment and absolute rest, vertebrael height reduction as a result of osteoporotic fracture and formation of kyphotic deformity, presence of PLL and healthy vertebrael posterior wall, no fractured pieces inside the canal and absence of any neurological defects. Certain exclusion criteria were also defined such as history of vertebrael fracture within the last 6 months, neurological disorders before and after operation, affliction with life-threatening systematic diseases like systematic infectious diseases, malignancies, lack of consent to take part in the research, affliction with bone disorders such as bone and muscular tissue tumor, affliction with osteomyelitis, diskitis or epidural abscess and infection of surgical site soft tissue, affliction with severe coagulopathy or thrombocytopenia, exhibiting symptoms of more concealed fractures (PLL fracture), vertebrael posterior cortex fracture and existence of pieces inside the canal. Prior to beginning the research, the participants were asked to fill in and sign the consent for to take part in the research. Participant’s demographic information such as age and gender and history of background diseases such as diabetes, high blood pressure, cardiovascular diseases, smoking cigarettes, etc. were recorded from their files. The full face radiologies of thorax and full face and sideview radiologies of spinal column were captured. Spinal column MRI was conducted to check for fractured vertebrae and edema and to disprove malignancy of spinal column. CT scan was conducted on the vertebrae to study the posterior wall of the vertebrae, then BMD, cobb angle, kyphotic angle and height of vertebrae (HA HM HP) were measured (using X-ray). Kyphotic angle is the angle between the line parallel with the upper end plate and the upper line parallel with the lower end plate indicating the compression level of fractured vertebrae. Cobb angle is the angle between lines parallel with the upper endplate of the vertebrae above the fractured one with the line parallel with lower endplate of the vertebrae under the fractured one indicating the curvature of spinal column caused by fracture. Anterior height shows vertebrael height in the anterior 1/3 of the body between the upper and lower high end plates. Middle height is the vertebrael height in the middle 1/3 of body between the upper and lower end plate and, while posterior height indicates the vertebrael height in the posterior 1/3 of the body between the upper and lower endplates. The patients then underwent kyphoplastic surgery. Based on the medical examinations prior to operation, general or local anesthesia was used for operation. In prone and rolling status, a jelly was placed on thorax and Iliac crest. Using a fluoroscope and counting, the surgeon identified the site of fracture. After dermal prep and drep, 2% lidocaine was injected in insertion site and paraspinal muscles up to vertebrael periosteum and facet capsules. Prior to skin incision, prophylaxis was injected in the vessels by scalpel number 15. The drill head was inserted in the small skin incision site up to vertebrae facet in the area where lateral papillae met with the lower part of the facet. The site for pedicle entrance was found through face and sideview graphies. After inserting the pedicle and at the entrance of the body, cannula set entered the body and the drill head entered body through cannula. The drill head was directed towards body with medial 15° direction under fluoroscopic guide until it reached the optimal site to commence cement insertion. This site selected for cement insertion is located in the anterior 1/3 of the body where the greatest amount of height reduction is observed. The drill was then removed and the balloon was inserted through the guide cannula. The cannula was filled with contrast agent and deaerated and the balloon opened as much as 150 to 200 atmospheres. All these steps were also taken for the opposite side before opening the balloon if bilateral injection was required and the relative balloon was opened. Face and sideview graphies were made once again and the expansion of vertebrae and leakage of contrast agent were assessed. The balloons were then evacuated and removed and the cement which was prepared in advance was put inside injection cylinders and injected into the body of vertebrae. The best time to inject the cement is when it has a dough-like consolidation like a pig tail while getting out of the syringe. A loose consolidation increases the possibility of cement leakage from fracture lines to spinal canal or disk space or retro peritonea. As much as 1.5 cc cement was injected every time with lateral graphies made after each injection. The injection would be stopped if any leakage were observed. The injection path passed through the anterior part of the body towards the middle part of it. No injections were made in the posterior part in order to prevent possible leakage. If local anesthesia is used for operation, the force reaction of organs can be every second. The amount of cement injected and the site of unilateral or bilateral injection was recorded. At the end of injection, the insertion site was needle sutured for 5 minutes. After proper dressing of the incision, the patient returned to supine position and left the operation room after he had been completely checked for symptoms of allergy or emboli and the sensory or motor neurological status of the lower limbs were examined. VAS was used to measure the level of pain. If the patient had not gone general anesthesia, he could have been discharged on the same day. The length of operation and the amount of cement injected during operation was measured. After the operation was over, BMD, kyphotic angle and Cobb angle were assessed (using X0ray imaging) and their changes were recorded. Finally, SPSS v.21 was used to statistically analyze the resulting information according to X2, ANOVA, and t-test methods. This is a self-controlled clinical trial study conducted on 30 patients 26 (87.7%) of whom were female and 4 (13.3%) were male. Their average age was 65.83 ± 9.06 years with the youngest and oldest participants being 45 and 81 years old. The average T-score was 3.4 ± 1.13 with the lowest and highest scores being -5.6 and -1.4 respectively. The average Z-score was -1.1 ± 69.02 with the lowest and highest values being -4.5 and -0.2 respectively (Table 1). Table 1. Mean and SD of Z-SCORE and T-SCORE. The results indicate a significant reduction in Kyphotic-angle and Cobb-angle after surgery, while Ant-height and Middleheight have increased significantly after surgery. However, changes in post-height variable have not been significant (Table 2). Table 2. Comparing the SD and mean of Kyphotic-angle, Cobb-angle, Ant-height, and Middle height before and after operation. To better analyze the results, the effects of T score and Z score on the consequences of kyphoplasty was studied in three groups based upon levels of T score and Z score. The results show that a reduction in level of T score and Z score core or intensification of osteoporosis would result in significant increase of average difference of kyphotic and Cobb angles and height of vertebrae in the anterior and the middle part (P=0.0001). These changes were far from being significant in height of vertebrae in the posterior part (Tables 3 and 4). Table 3. Comparing the mean and SD of kyphotic angle, Cobb angle, anterior height, middle height and posterior height before and after operation based on levels of t-score. Table 4. Comparing the mean and SD of kyphotic angle, Cobb angle, anterior height, middle height and posterior height before and after operation based on levels of z-score. The results show a negative correlation between T score and Z score and average difference of Ant height and Middle-height before and after operation. In other words, a rise in T score and Z score caused a decrease in average Ant height and Middle height before and after operation. In statistical terms, this difference about T score and Z score and average difference of cobb_abgle and kyphotic_angle and before and after operation has a positive correlation. In other words, as T score and Z score go up, the average difference of cobb_angle and Kyphotic_angle increases although this correlation is not statistically significant and noticeable in post height (Table 3 and Figures 1 and 2). 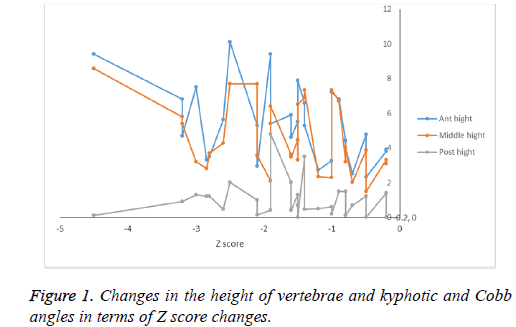 Figure 1: Changes in the height of vertebrae and kyphotic and Cobb angles in terms of Z score changes. 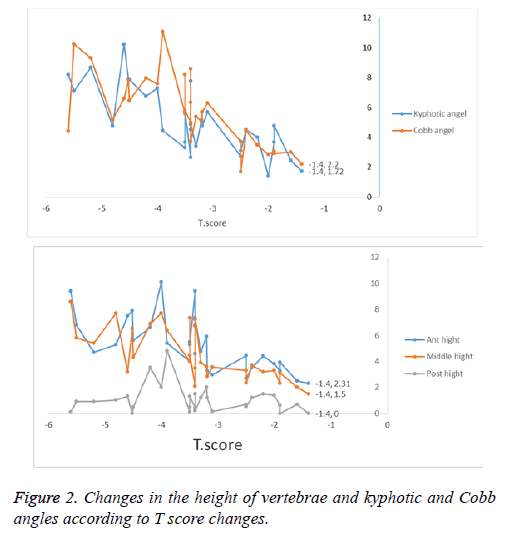 Figure 2: Changes in the height of vertebrae and kyphotic and Cobb angles according to T score changes. Comparing the mean and SD of kyphotic angle, Cobb angle, anterior height, middle height and posterior height before and after operation based on levels of z-score (Table 4). Pearson’s correlation between Tscore, zscore and outcomes of surgery (Table 5). Variance analysis with repetitive values was used to study VAS changes (Figure 3). The results are presented in Table 6. As the results indicate, patient’s level of pain has increased significantly after operation. Figure 3: Mean VAS changes among patients undergoing operation. Table 5. Pearson’s correlation between T score, Z score and outcomes of surgery. Table 6. Mean and SD of pain level based upon VAS in various times. The results indicate a positive correlation between T score and Z score and the mean difference of pain score before and immediately after operation. As the T score and Z score increase, the mean difference of pain score before and immediately after operation also goes up. Higher levels of pain reduction are observed among those with high levels of T score and Z score, but this difference is not statistically significant (Tables 7 and 8). Table 7. Paired comparison of average pain changes according to VAS in various times. Table 8. Pearson correlation between T score, Z score and pain scale. Table 9 compares pain improvement in various times after operation with improvement of cobb ang, kyphotic ang and with the height of vertebrae in HP. HM, and HA where the results of the analysis showed no significant correlation between them (P-value>0.05). Table 9. Comparing the correlation between pain improvement in various times with improvements in the angles and height of vertebrae. Both kyphotic angle and cobb angle of those patients who had unilateral and bilateral injection of cement had decreased significantly after operation and men Ant height and Middle height had increased significantly after operation. However, changes in Post height were not significant (Table 10). Table 10. Comparing mean and SD of kyphotic angle, Cobb angle, ant height, middle height and post height before and after operation based upon the site of cement injection. No significant difference was observed between kyphotic angle, Cobb angle, Ant height, and middle height before and after operation in unilateral and bilateral injections and the mean post height before and after operation in unilateral and bilateral injection was not significant. The site of injection caused no significant difference in the results of operation (Table 11). Table 11. Comparing unilateral and bilateral injection in the results of operation. Variance analysis with repetitive values was conducted on pain scales based upon the site of cement injection. The results show that the average pain after operation has decreased in various times (P=0.0001) but there is no significant difference between the unilateral and bilateral injection in terms of average pain (P=0.889) (Table 12). Table 12. Mean and SD of pain scale according to VAS in various times based upon cement injection site. Variance analysis with repetitive values was conducted on pain scale based upon cement injection site and by controlling the confounding effect of cement doze, T score and Z score. The results show that post-operation average pain has decreased in various times (P=0.0001), but there is no statistically significant difference between average pain in unilateral and bilateral injection by controlling the confounding effect of cement doze, T score and Z score (Table 13). Table 13. Variance analysis results with repetitive values conducted on the pain score based upon cement injection site. The results of Bonferroni coupled comparison showed a statistically significant reduction in the average pain of the patients with the confounding effect of cement dose Z-score, Tscore in various times (Table 14). Table 14. Bonferroni coupled comparison. The most common post-operation complication was cement leakage observed in three cases that all had bilateral injections above 6 cc. Two leakages were reported from the upper endplate in disk space and one case was reported under all in the anterior vertebral body (Table 15). Table 15. Frequency distribution of complications of surgery. The average amount of cement injected was 5.48 cc with the highest and lowest quantities being 7.5 cc and 1.5 cc respectively (Table 16). Table 16. Mean and SD injected cement dose. The greatest frequencies of fracture were observed in T12 (34%) and L1 (23%) (Figure 4). 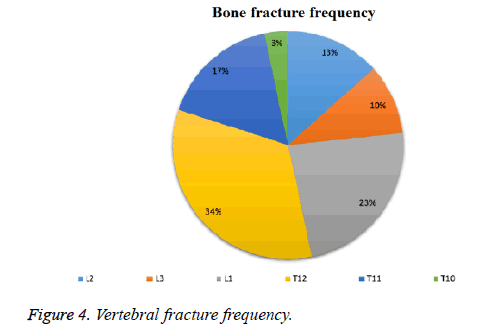 Figure 4: Vertebral fracture frequency. The results of this research helped us grasp the consequences of using kyphoplasty in our center. In a research conducted by Liu et al. , the frequency of fracture among women was 77.8% while this frequency among men was 22.2% with the average age being 71.6 y . In our research, the frequency of fracture among women and men was 86.67% and 13.33% respectively with the average age being 65.83 ± 9.6 y. Liu et al. [10,11] studied the effects of spinal column status correction during kyphoplasty and the effect of osteoporosis level on the results of operation two groups afflicted with osteoporosis and osteopenia afflicted with osteoporotic fracture where the preoperation lateral radiographies and vertebral heights and angles of 50 patients were studied. The vertebral status correction was conducted on Cobb A, KA, HM, HA with P-value<0.05 and the correction level in the fractured vertebrae in osteoporotic group was more than osteopenic group (P-value<0.05). The greatest level of correction was observed in hyperextended position with no increase in vertebral height and angle with ballooning. As the osteoporosis increased and post-operation reduction of T-score and Z-score, more height increase (Ha. Hm) and kyphotic and Cobb angles correction were observed than those who had a better bone density. This raised correction for HA, HM, KA, Cobb A had a p-value of 0.001, while it had no influence of P-value>0.05 for HP. In a research by Baz et al. [12,13], the effects of kyphoplasty were studied in 82 patients suffering from osteoporotic fracture during a 1-y follow-up period. 87.8% of the participants were female and 12.2% were male with the greatest frequency of fracture observed in thoracolumbar are (62%) with 30 cases of fracture in L1 and 24 cases in T12 . Comparison of the average pre- and post-operation vertebral heights of HM, HA and KA vertebral angle was corrected by p<0.0001. Pre-operation mean VAS was 7.92 but this value decreased to 2.21 immediately after operation and to 1.98 one year later which indicates a good response with p=0.0001. But the vertebral height in the posterior height did not increase during the operation (p<0.05). The most common site for osteoporotic fractures was the thoracolumbar area with the greatest number of fractures observed in T12 and L1 and 86.67% of the patients were female. Similar results were achieved concerning pre- and post-operation mean difference of vertebral height in HM, HA and KA and Cobb A angles. Just like the above-said research, no significant change was observed in vertebral height in posterior HP (Table 2) which is probably due to similar techniques used for cement injection. Similar results were observed in comparison of the two researches in terms of VAS which confirms the effectiveness of kyphoplasty balloon in controlling patients’ pain (Table 7). Son et al. conducted a review research in order to compare the unilateral and bilateral kyphoplasties in treating vertebral osteoporotic fractures. Their results pointed to the fact that unilateral operation took a shorter time (P<0.001) with less cement injected (P<0.001). No correlation was observed between pain and Oswestry disability index and reduction of kyphosis angle and vertebral height. They arrived at the conclusion that both types of surgery were safe and effective although less cement and less time is spent in unilateral operation and the patient will stay in the hospital for a shorter time . In those patients with unilateral and bilateral injections of cement, the mean of kyphotic angle, Cobb angle had decreased significantly after operation, while the average Ant Height and Middle Height indexes showed a significant rise after operation. The comparison between the average kyphotic angle, Cobb angle, Ant height and Post height before and after operation in unilateral and bilateral injections shows no significant difference. The pain scale of the patients reduced significantly after operation and the average pain score after operation decreases in various times (P=0.0001) but no statistically significant difference was observed in average pain score in unilateral and bilateral injections (P=0.889). The most frequently reported complication was cement leakage (10%) mostly observed in bilateral injection. This leakage was mostly to the anterior part of the body or disk space. Dong et al. conducted a research in order to compare the effect of kyphoplasty and vertebroplasty in reducing the pain of 86 patients with osteoporotic fractures. 35 had undergone vertebroplasty and 51 had undergone kyphoplasty followed by a 36-month follow up period. The greatest frequency of osteoporotic fracture was observed in T12 and L1. VAS, vertebral height and kyphosis angle were studied before and after operation and at the end of the follow-up period. The pain score had decreased significantly after operation in both groups (P<0.001) and pain score improvement showed no statistically significant difference in both groups (P=0.826). In kyphoplasty group, vertebral height improvement exhibited a statistically significant difference (P<0.001) and the kyphosis angle also had a statistically significant difference (P<0.001). Despite greater height and kyphosis height correction, no correlation was observed between pain and vertebral height (P=0.219) and kyphosis angle and pain score (P=0.312). Both vertebroplasty and kyphoplasty are useful to reduce pain but no correlation is seen between pain score and vertebral height and kyphosis angle [14,15]. Most fractures were observed in T12 and L1 in present research (34% and 23% respectively). The pain scale reduced significantly after operation and average pain score after operation had decreased in various times (P=0.0001). Similar to the research conducted by Dung et al. , despite greater correction of vertebral height and Cobb A and KA angles in people with more severe osteoporosis and lower T score, no statistically significant correlation was observed between vertebral height improvement level, kyphosis and cobb angles and pain relief (Table 9). The important point also referred to by Dung is the effectiveness of cement injection in pain relief. The neuroleptic chemical and thermal effect of the cement is fixing micro-fractures in the body of vertebrae. No correlation was found between correcting the height and sagittal balance with pain relief. In the same way, there was also no correlation between kyphotic angle and pre-operation pain level. A research was conducted by Alghamdi et al. on 220 patients suffering from kyphoplastic fracture in order to assess the effect of cement distribution and volume of the cement injected in fractured vertebrae with the results of operation including VAS and height and kyphosis angle. They arrived at the conclusion that the level of cement distribution improves the height and kyphotic angles with greater sensitivity and exclusiveness than cement volume (P-value<0.05). On the other hand, fracture of the adjacent vertebrae and cement leakage are caused by the excessive amount of the cement injected not the excessive distribution of cement. Cement distribution level is a much better factor to predict pain relief (VAS) after operation than the amount of cement injected (P value< 0.05) . The current research failed to find a significant correlation between the amount of cement injected and pain relief after operation (Table 13) P value=0.207. On the other hand no significant correlation was observed between average changes and improvement of vertebral height (HA, HM, HP) and kyphotic and Cobb angles and the level of pain relief in various times after operation. This fact confirms the effect of other factors such as cement distribution level on pain relief. In a research by Schofer et al. conducted on 30 patients in case group and 30 in control group in order to compare the effect of kyphoplasty with vertebroplasty in correcting fracture among patients suffering from osteoporotic fractures in a 13-month follow up period, no significant difference was found between VAS and life quality (SF-36) in both methods, but better correction of kyphosis angle was achieved in kyphoplastic surgery and this difference is statistically significant . No correlation was found between the severity of fracture and vertebral fracture reduction with pain scale. In the current research, kyphosis angle has improved more and the mean kyphotic angle and Cobb angle after operation has reduced significantly, but men Ant height and Middle height indicators have increased significantly after operation. However, Post height changes were not significant. No correlation was observed between correction level of kyphosis angle and vertebral height and pain scale. This study is an extract of an MA thesis with the ethics code IR.ARAKMU.REC.1395.55 passed on May 24th, 2016 and clinical trial code IRCT2017010220258N23. The author wishes to thank the research and technology deputy of Arak Medical Sciences University and Clinical Researches Development Center of Vali Asr Hospital. All procedures performed in studies involving human participants were in accordance with the ethical standards of the institutional and/or national research committee and with the 1964 Helsinki Declaration and its later amendments or comparable ethical standards. The study protocol was approved by the Ethics Committee of Arak University of Medical Sciences. Taguchi A, Ohtsuka M, Tsuda M, Nakamoto T, Kodama I, Inagaki K. Risk of vertebral osteoporosis in post-menopausal women with alterations of the mandible. Dentomaxillofac Radiol 2007; 36: 143-148. Briot K, Fechtenbaum J, Roux C. Clinical relevance of vertebral fractures in men. J Bone Mineral Res 2016; 31: 1497-1499 . He Q, Xu J. Transpedicular closing wedge osteotomy in the treatment of thoracic and lumbar kyphotic deformity with different etiologies. Euro J Orthop Surg Traumatol 2013; 23: 863-871 . Cho W, Lenke LG, Bridwell KH, Hu G, Buchowski JM, Dorward IG, Pahys JM, Cho SK, Kang MM, Zebala LP, Koester LA. The prevalence of abnormal preoperative neurological examination in scheuermann kyphosis: correlation with x-ray, magnetic resonance imaging, and surgical outcome. Spine 2014; 39: 1771-1776 . Yaman O, Dalbayrak S. Kyphosis: diagnosis, classification and treatment methods. Turk Neurosurg 2014; 24: 62-74 . Nguyen NLM, Kong CY, Hart RA. Proximal junctional kyphosis and failure-diagnosis, prevention, and treatment. Curr Rev Musculoskeletal Med 2016: 1-10 . Negrini A, Donzelli S, Maserati L, Zaina F, Villafañe JH, Negrini S. Junctional kyphosis: how can we detect and monitor it during growth? Scoliosis Spinal Disorders 2016; 11: 38 . Heyde CE, Tschöke SK, Robinson Y, Kayser R. Kyphoplastie: Indikation und praktische Durchführung. (Kyphoplasty. Indication and practical guidelines). Tägliche Praxis 2012; 53: 799-810 . Svedbom A, Alvares L, Cooper C, Marsh D, Ström O. Balloon kyphoplasty compared to vertebroplasty and non-surgical management in patients hospitalised with acute osteoporotic vertebral compression fracture: a UK cost-effectiveness analysis. Osteoporos Int 2013; 24: 355-367 . Liu HX, Xu C, Shang P, Shen Y, Xu HZ. The effect of postural correction and subsequent balloon inflation in deformity correction of acute osteoporotic vertebral fractures. J Korean Neurosurg Soc 2014; 55: 337-342. Sun H, Pei-Pei L, Liu J, X Y, Ping-Hui Z, Shen X. Can unilateral kyphoplasty replace bilateral kyphoplasty in treatment of osteoporotic vertebral compression fractures? A systematic review and meta-analysis. Pain Physician 2016; 19: 551-563. Baz AB, Akalin S, Kiliçaslan ÖF, Tokatman B, Arik H, Duygun F. Efficiency of balloon kyphoplasty in the treatment of osteoporotic vertebral compression fractures. Kobe J Med Sci 2016; 62: 49-54. Dong R, Chen L, Tang T, Gu Y, Lou Z, Shi Q, Li X, Zhou Q, Yang H. Pain reduction following vertebroplasty and kyphoplasty. Int Orthop (SICOT) 2013; 37: 83-87. Alghamdi HS, van den Beucken JJ, Jansen JA. Osteoporosis-fracture healing and osseointegration. Drug Discovery Today: Disease Models 2014; 13: 3-9 . Chen H, Liu N, Xu X, Qu X, Lu E. Smoking, radiotherapy, diabetes and osteoporosis as risk factors for dental implant failure: a meta-analysis. PLoS One 2013; 8: e71955 . Schofer MD, Efe T, Timmesfeld N, Kortmann HR, Quante M. Comparison of kyphoplasty and vertebroplasty in the treatment of fresh vertebral compression fractures. Arch Orthop Trauma Surg 2009; 129: 9-1391.